Our popular Farmhouse style continues to stand the test of time as a distinguished choice for premium solid wood furniture. Pair farmhouse style and solid pine wood and the combination is something to get excited about! This Amish Pine Farmhouse Coffee Table comes from combining premium woodworking skills with Eastern white pine. The result? 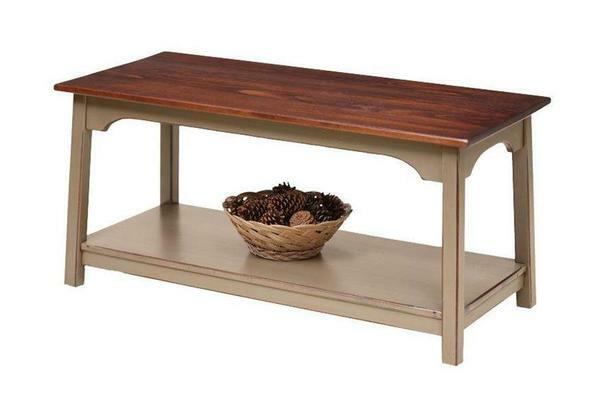 A breathtaking coffee table that is charming, warm and very affordable! Furnish with solid wood and enjoy the affordability of pleasant and pretty pine tables! Have fun viewing our pine wood farmhouse small end table, pine wood farm house large end table, and side tables to complement the look. Coffee tables are essential to complete the framework of your living room space and to assist in creating a fun, fully functioning collection of pine wood furnishings. The spacious top of this Pine Coffee Table is ready to hold drinks, serving trays, reading materials and more. The lower shelf keeps your favorite book as well as the remote handy and organized. Visit our blog for fun and creative ways to display your favorite accent tables.